This PDF 1.5 document has been generated by Microsoft® Word 2010, and has been sent on pdf-archive.com on 27/11/2013 at 03:35, from IP address 173.175.x.x. The current document download page has been viewed 1258 times. File size: 966 KB (7 pages). robots here proposed are fundamentally different from tendonactuated robots, however, as their Grübler mobility is infinite. rigidity, dynamic agility, and load capacity per unit mass1,2. cannula robots acting in parallel. curvature kinematics to account for straight rods. explained in the following sections. effector pose (rod task space to robot task space). method solution to transform joint values to arc parameters. essential for a general model. to positive rotation about the X axis. where is the total number of legs. overarching method to determine specific robot kinematics. robot base to the plane in which the end effector lies ( ). applied but inverse kinematics become possible. bifurcation do not affect the legs. 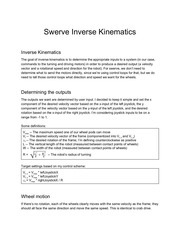 constant curvature assumption and rod kinematics. to run on the same machine. direct resolved rates control of the mechanism.
. This actuation range encourages greater tube offsets. curvatures changed fairly consistently the rod bending plane of this threeleg robot rapidly shifted to attain lower energy configurations. forces of each rod tip—for a given wrench. three or more legs (3D) has unknown reaction forces. equals the number of unknowns. previously described, plus the initial rod tip position vector. position of each rod tip satisfies the mechanism geometry. increases as the difference in rod curvatures increases. in a direction via an external wrench at the current leg lengths. to the legs than applied forces parallel to the legs. both joint space and workspace. These plots were simulated with a twoleg, zero precurvature flexible parallel robot. been normalized to better show their orientation. swivel on the right and left legs respectively. base of that rod lies on the circle. we would typically mark these graphs using YZ axes. effectors and cheap parallel robots. rods appear to increasingly diverge from circular arcs. Hendrick, for their help and kindness throughout my research. architectures.” Parallel Robots. 2nd ed. Dordrecht: Springer, 2006. Simaan, N. Lecture notes. Robotic Manipulators ME331. Vanderbilt University, Nashville, TN. Spring 2013.
surgery. Diss. Johns Hopkins University, 2007. III, R. J. A flexure-based wrist for needle-sized surgical robots. information sciences 139, 508-527 (1990). 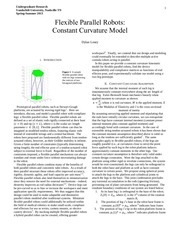 modeling of constant curvature continuum robots: a review. sensing and control. Diss. Vanderbilt University, 2011.
loading. IEEE Transactions on Robotics 27(6), 1033-1044 (2011). This file has been shared by a user of PDF Archive. Document ID: 00136534.